The European Commission Vice President, Neelie Kroes, has delivered a farewell speech to the members of the European Telecommunications Network Operators’ Association (ETNO); in which she urged telcos to embrace over-the-top (OTT) players, and stated her dream for the European telecommunications sector after the current Commission’s tenure ends at the end of October. 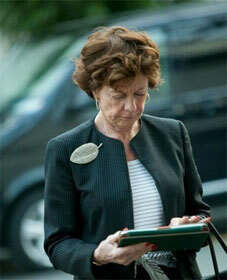 It’s true, the telecoms operators and Kroes haven’t always seen eye to eye. Kroes has occasionally pointed at an uncooperative telecoms market as a key factor holding back the progression of the Commission’s Digital Single Market proposal. Meanwhile, action regulating roaming revenues saw a reduction of roaming data fees by 55% in 2014 compared to 2013, and between 20% and 30% reductions in call and messaging fees. Kroes also went on to urge operators to change their views of OTT players in the industry, and highlighted digital content providers as a key motivator for consumer use of broadband services. Rounding off her somewhat sentimental speech to ETNO, Kroes reminded the operators’ that the Digital Single Market proposal will be maintained and advanced during the tenure of Jean-Claude Juncker, who begins in office as the European Commission’s President on 1st November. So this woman is basically supporting non EU OTT companies and she works for the EU, very strange. She has weakened the EU telecom sector to such a point that it is vulnerable to foreign take over and has difficultly to invest in 4G. Why should she be telling Telecom companies what their strategy should be? Just have a basic competitive landscape in place and let the market decide!